I'm looking at this web page right now in Safari. Safari is a normal window (say, 50% of the width and height of the physical screen, and it is sitting right in the middle of the physical screen). Using the pointer, I grab an image (say, one of the small icons on this screen). After a few moments, the "whole desktop" will slide to a new desktop on the "right". And click here for a video !!! I want to completely disable this "sliding" function. (Or at least know what the hell it is!!) Is it possible? Related! How do I correctly set strictly ONLY ONE desktop? Now select the minus sign (-), the last on that list and click OK button. You will have one and only one desktop if all hot corners are marked with minus sign. So, try to avoid the regions declared as "hot corners" when dragging. 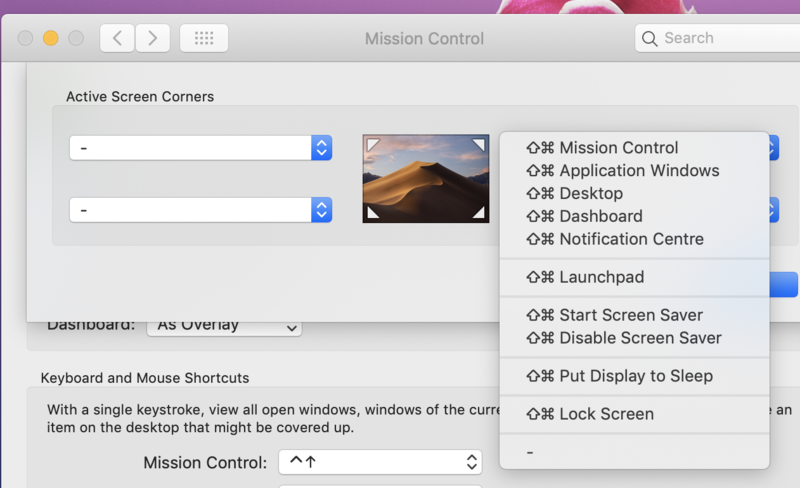 However, if you still need another desktop, add "Mission Control" for the right hot corner. Moving the mouse to the upper right you can add a new desktop. But moving a window to the right will not open a new desktop. In the Dock you can also assign your apps to "All Desktops". instead of using a smaller delay, you could try to use a very large delay. I haven't tested it. Please report the result. PS: I tried that if there is only one Desktop, it won't 'slide to next'. It seems that when you have more than "a hundred" or so the interface becomes so confusing, I didn't even know I had 2 desktops. It remains a mystery why I had 400 desktops. When you do have only 1x desktop, then as Dr.Nixon reports the problem I describe indeed does not happen. Not the answer you're looking for? Browse other questions tagged mojave spaces . Can't create a new desktop workspace?